Since I always like some good milestones, this week I had the pleasure of two of them: my first (official) visit with my new midwives, and the end of my injectable meds! 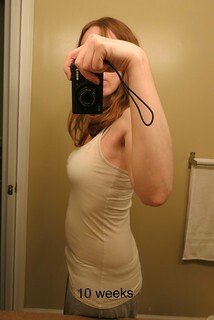 :) Oh, and a third: I'm apparently showing already.... or at least my bloated belly has taken on the shape of a baby belly. So Thursday I went in to see my new midwives, and it's just such a difference from everywhere else I've received care. They have a free-standing birth center, and appointments are done in the birthing suites rather than in a regular office environment - and the birthing suites are just beautiful. I kind of want to live there. I also get to end my injectable meds tonight. I really could have switched over to non-injectables several weeks ago, but since I had already paid for enough injectable meds to get me through 10 weeks, I figured we might as well stick with the injectables (pun not entirely intended). The bruising hasn't been that bad this time around (with Josie, towards the end it was just shots into bruises and welts every day - not pleasant), but my back's readiness to bleed has been, so I will not miss these daily shots. 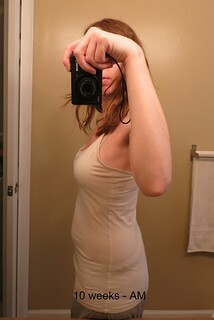 Finally, on Tuesday I noticed what appeared to be a baby bump. 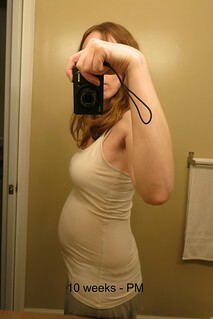 Now, I know subsequent pregnancies can start showing earlier, but being barely 9 weeks at the time seemed to be excessive, since the baby isn't even the size of my fist yet. 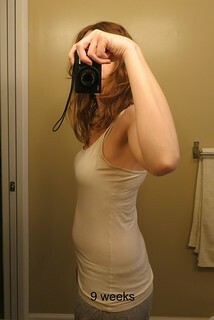 But regardless of what I think, every morning since then I've woken up looking just a touch thicker than usual, and by the end of the day, there is a definite bump. So we'll see how much longer before people start noticing. I didn't really start telling people at work until at least 16 weeks with Josie, and I have the distinct feeling that that won't be possible this time around.